AHR Hockey is proud to announce that we have meet all of the requirements set fourth by the NCAA for being a scouting service in the sport of ice hockey. The NCAA changed section 13.14.3 of the Div. 1 manual to detail that schools may ONLY subscribe to scouting services that meet the stringent criteria for being such. With this announcement comes another that AHR Hockey will be setting up a recruiting portion of the website, dedicated to players learning about all options available to them in ice hockey. These options will be set fourth in a way that is positive and speaks to the benefits of each path the player might take. AHR Hockey will not facilitate a NCAA vs CHL battle. Each side will be asked to provide material for players to look over as the to what each path can do for your hockey career. AHR Hockey will also be asking individual leagues to provide material as well, as to how they can further a players career path. 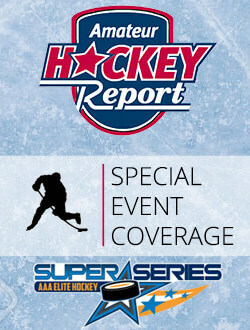 Additionally AHR Hockey will be producing a series of podcasts with persons from the CHL, NCAA, USHL, NAHL, BCHL etc.. speaking about their leagues so players can hear about what positive advantages they offer. All of the podcasts will be offered free of charge, as well as all other AHR Hockey scouting podcasts from the past and going forward will be available for all to listen to at their leisure. In January 2010 the NCAA changed the rules on what NCAA programs could spend their recruiting budget on, and one of those things was scouting services. A NCAA program may ONLY subscribe to a “scouting service” that is compliant with the rules below. As of this printing it is our understanding that AHR Hockey is the only scouting service to be compliant and meet all of the criteria set fourth for being such.